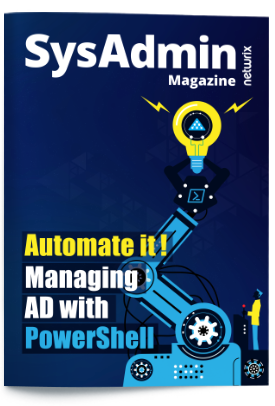 Set the retention method for the security log to "Overwrite events as needed". Link the new GPO to OU with User Accounts: Go to "Group Policy Management" → Right-click the defined OU → Choose "Link an Existing GPO" → Choose the created GPO. Force a Group Policy update: Go to "Group Policy Management" → Right-click the defined OU → Click "Group Policy Update". 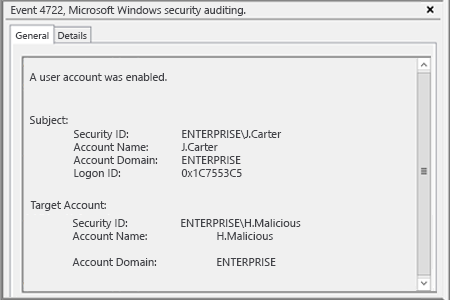 Open Event Viewer and search the security log for event ID 4722 (a user account was enabled). 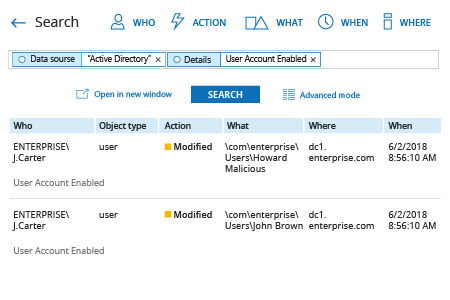 Click the “Search” button and review who enabled which user accounts in your Active Directory. If an account is enabled without reasonable cause, it may be a sign that an attacker is trying to gain access to the network. Constant monitoring of recently enabled accounts pinpoints who is trying to get unauthorized access to the system and helps to quickly remedy the issue.